As that claustrophobic unit, the nuclear family, was being carved out of a much larger family aggregate, photography came along to memorialize, to restate symbolically, the imperilled continuity and vanishing extendedness of family life. Those ghostly traces, photographs, supply the token presence of the dispersed relatives. A family’s photograph album is generally about the extended family – and often, is all that remains of it. 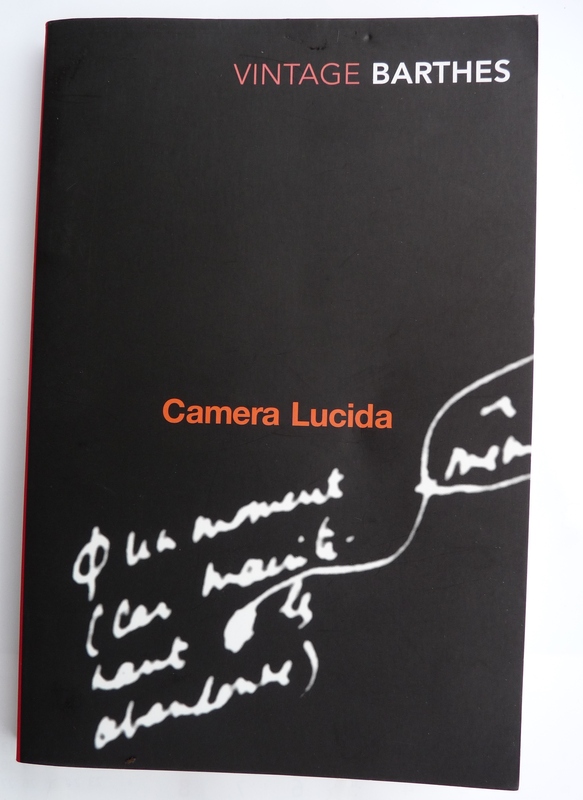 In the second part of Camera Lucida (1980) – Roland Barthes’ strange and moving text on the nature of photography – Barthes describes the futile search for the essence of his recently deceased mother in her collection of family photographs. Now, one November evening, shortly after my mother’s death, I was going through some photographs. I had no hope of ‘finding her’, I expected nothing from these ‘photographs of a being before which one recalls less of that being than by thinking of him or her’ (Proust), I had acknowledged that fatality, one of the most agonizing features of mourning, which decreed that however often I might consult such images, I could never recall her features (summon them up as a totality). Later in the book, however, we discover that Barthes finally believes he has succeeded in finding the image which defines his mother for him. There I was alone, in the apartment where she had died, looking at these pictures of my mother one by one, under the lamp, gradually moving back in time with her, looking for the truth of the face I had loved. And I found it. Barthes goes on to describe this photograph (the ‘Winter Garden Photograph’) of his mother as a young girl in great detail – although maddeningly he chooses not to reproduce it in the text, as he does other images. His reasoning for this decision is that for us it would be nothing but an indifferent picture and would not possess the ability to wound us or remind us of our own mortality in the same way it does for him. Much has been made about the omission of this photograph, with some scholars going so far as to even doubt its existence – at least in the form that Barthes described. Whether this is true or not, Barthes is at pains to describe the anguish felt at being unable to penetrate the other images of his mother, whereas the only one which has given me the splendour of her truth is precisely a lost, remote photograph, one which does not look ‘like’ her, the photograph of a child I never knew. This search for the ‘true identity’ of his mother relates in part to the first section of Camera Lucida, in which Barthes describes the impact that certain photographs have on the viewer. He does this by using two terms which have since become commonplace in the study of photography. The first is the studium – which can loosely be described as what the photographer intended the image to represent (a calculated decision); whereas the punctum is what unexpectedly ‘pierces’ the viewer, breaking through the intellectual coldness of the studium. So according to Barthes, the ‘Winter Garden Photograph’ would possess no punctum for us – but would simply be a study of a brother and sister in a conservatory, or winter garden, at the turn the century. In other words, it would (if at all) only affect us at the level of the studium. By deciding not to publish the picture, Barthes is possibly recreating his own frustrations at being unable to go beyond his initial feeling of euphoria at having ‘discovered’ his mother – to accede to what is behind. Barthes goes on to describe his desire to enlarge the details of the photograph in order to try to get closer to the essence of his mother, knowing as he does so that it will only distort the image and render it even more difficult to ‘see’. According to Barthes, a photograph can never totally surrender its secrets to the viewer: this is the ultimate nature of the photograph as that-has-been. Barthes does, at least, admit to photography’s more superficial ability to make the genetic attributes of a person more prominent – something of particular interest for family historians. He states: But more insidious, more penetrating than likeness: the photograph sometimes makes appear what we never see in a real face (or in a face reflected in a mirror): a genetic feature, the fragment of oneself or of a relative which comes from some ancestor. Perhaps it is both things we ourselves are seeking when we scrutinise our own family photographs. When I look at the picture of my grandmother as a child outside the old family home in Brixton (I Remember, I Remember), am I not looking for her essence and her connection to me? When I look at the photograph of myself as a baby on her lap, over half a century later, am I not asking myself: Is this where my fat face comes from? And my renewed interest in discovering more about my London ancestors was, in part, rekindled by the discovery of the hand-coloured photograph of my father as an evacuee in East Coker (see In my Beginning is my End). When I first came across the image it was as if I was looking at another father – one who seemed more carefree than I had ever known him to be – and the idea that this ‘lost father’ could be the key to understanding the complex and at times contradictory individual I’d known, seemed very appealing. But, like Barthes, my initial feeling of excitement at having this sudden window thrown open onto the past soon turned to a certain degree of frustration at the obvious limitations of the exercise. In the final part of Barthes’ many-layered and wilfully obscure text, in which he reduces the idea of the photograph to that-has-been (the ultimate evidence of the existence of a moment in time, a mad image, chafed by reality), he attempts to pin down the emotion that certain pictures aroused (or ‘pricked’) in him – first calling it love, then settling on pity as a more apt description: . . . I passed beyond the unreality of the thing represented, I entered crazily into the spectacle, into the image, taking into my arms what is dead, what is going to die . . . The same sentiment is echoed in On Photography, when Sontag states that: Photography is an elegiac art, a twilight art. Most subjects photographed are, just by virtue of being photographed, touched with pathos. An ugly or grotesque subject may be moving because it has been dignified by the attention of the photographer. A beautiful subject can be the object of rueful feelings, because it has aged or decayed or no longer exists. All photographs are memento mori. To take a photograph is to participate in another person’s (or thing’s) mortality, vulnerability, mutability. Precisely by slicing out this moment and freezing it, all photographs testify to time’s relentless melt. Much has changed in the world of photography since these two influential texts were written – we are all photographers now, and the modern world is awash with a superfluity of images. However, in an age dominated by nostalgia, there has been renewed interest in ‘looking for the lost’: cataloguing things which have disappeared or are on the cusp of oblivion. Old photographs are treasured, reprinted, exchanged and collected, allowing us the opportunity to become custodians of the past. As Sontag points out: A photograph of 1900 that was affecting then because of its subject, would, today, be more likely to move us because it is a photograph taken in 1900. . . Time eventually positions most photographs, even the most amateurish, at the level of art. Our family were very typical of those in the pre-digital era, taking photographs only on holidays and high days. These select images were captured on Kodak slide film, which meant that they have been relatively well-preserved – even though there was often a certain amount of exasperation surrounding their inaccessibility (inevitably there were no functioning batteries available for the slide viewer when nostalgia struck). For a brief few years we also had a projector which magnified the images onto a screen – something which delighted us as children as we played poor man’s ‘home cinema’. But oh, if only we’d had the luxury of owning a ciné camera! What a privilege it would be to see those who are long-gone in front of us once more on fading Super 8, romping and waving with the air of determined glee that old amateur films seem to demand of their subjects. Conversely, Barthes is of the opinion that photographs are more poignant than the moving image by virtue of the fact that they capture only one specific moment and have no future referent. (In the Photograph, Time’s immobilization assumes only an excessive, monstrous mode: Time is engorged). He believes it to be impossible for photography to conjure up real memories (which are not static), and that it may in fact even lead to replacing them with false ones. 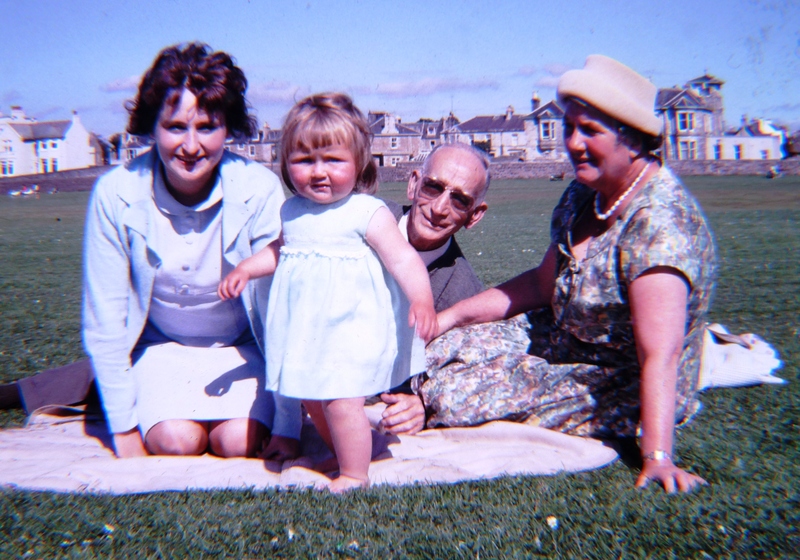 It is true to say that family albums do engender a certain amount of selective recall: for me, I can only ever recall being dressed in a kilt when I went to visit my grandparents in London. With my mother, in homemade kilt, London, early 1970s. What fascinates me now is the undeveloped dockland behind us. For family historians, the possession of a picture of a long-deceased family member may arouse similar feelings. When I first encountered the group portrait of my grandparents’ wedding (see banner image in the heading above) I was mesmerised by the fact that I was seeing my great-grandfather Arthur for the first time. Someone who had been born over a century before me and who had previously only been a name in a parish register and census return had suddenly taken on a ‘living’ form. Finally I could see where the family eyes came from, the bushy eyebrows, the high forehead. And when Barthes describes his wonderment and awe at seeing a photograph of Napoleon’s younger brother, knowing that he was looking at eyes that looked at the Emperor, then I understood exactly what he meant: I felt the same unsettling emotion at the idea that I was looking at someone who had known my mysterious great-great-grandfather, James Skelton (who plays a pivotal role in the family story). It is hard for me to find an illustration of my own personal equivalent of the ‘Winter Garden Photograph’, but one which comes very close is the image of my paternal grandfather, Sidney Skelton, below. 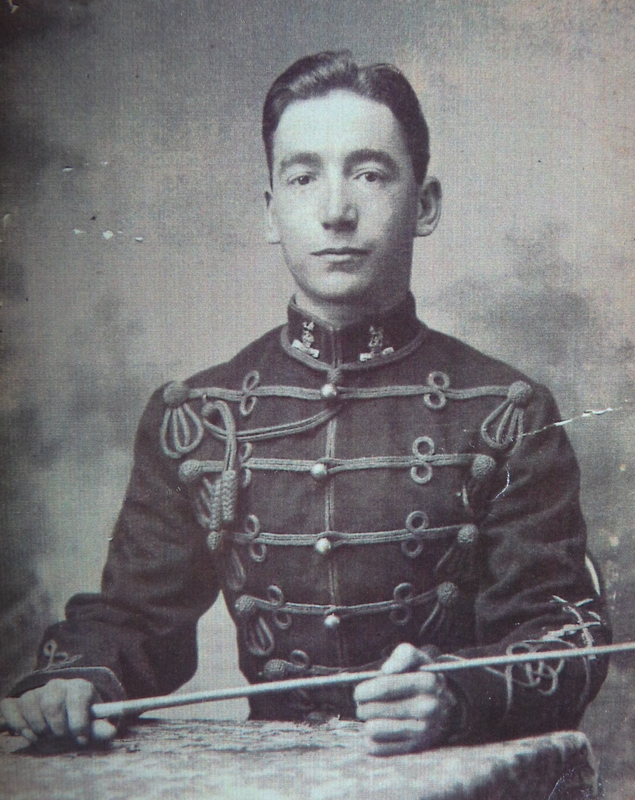 Little is known about this studio photograph, except that it was taken when he joined the Hussars, several years before the outbreak of World War One at a time when the British army was building up its reserves. Wanting to escape the poverty of a working class boyhood in Lambeth and the endless waiting at the docks in the hope of a day’s work, he may have inadvertently saved his own life by making that decision. (As a trained cavalry soldier he would have been in a much better position to survive the conflict than those who were hurriedly conscripted later). When my parents first received a copy of this photograph from my aunt, my mother decided to frame it and put it out for my father to appreciate – and this in a family that very rarely displays family photographs. But a few days later it disappeared: my father had packed it away because he found it too disturbing to see the image of his deceased father as a young man with his life still before him. At the time I thought this a rather odd thing to do. I loved the picture of my soldier-grandfather who I’d only ever known as a rather quick-tempered and gnarly old man, and of whom I had always been slightly afraid. And it fascinated me that the long sinewy fingers which held the riding crop were identical to mine and my father’s, particularly evident in the way we held books and newspapers. But for me it is the slightly drooping eyes – another family trait – which ‘pierces’ me. There is something both innocent and knowing about the way this young man looks straight at the camera, resplendent in his new uniform. It is almost as if he is able to see fearlessly into the future. His steady gaze and the slight flicker of a smile make me feel that he is telling us he has accepted his destiny , whatever it may bring, and that he is finally ready for his life to begin. This entry was posted in Photography and tagged Camera Lucida, Photography, Roland Barthes, Susan Sontag on January 1, 2016 by The Incidental Genealogist.